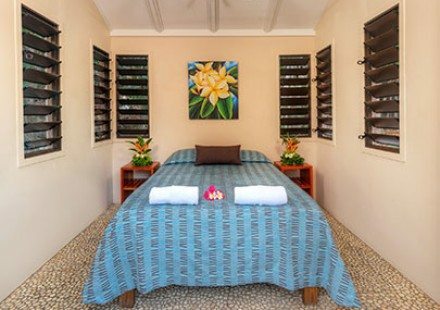 Looking to truly spoil yourself, perhaps it’s your honeymoon or anniversary, then our air-con Beachfront Villas are for you. 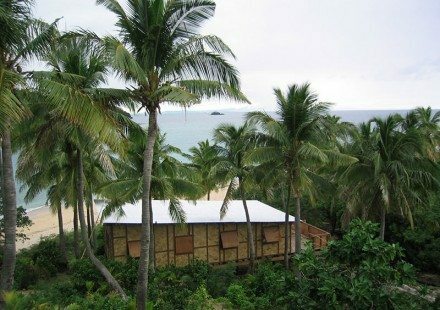 Are you looking for a private stand-alone bure in Fiji? 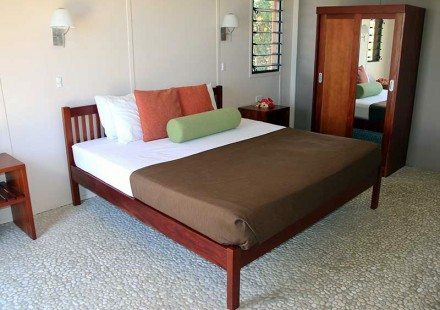 Our Reef Bure’s are a new category of accommodation for Mantaray Island Resort. Previously, Jungle Bures, our air-conditioned Reef Bures have been extended and now feature a landscaped outdoor shower and ensuite with flush toilets. Reef Bure’s come with bar fridge, tea and coffee making facilities, large ceiling fan and private balcony complete with outdoor furniture leading on to the beach. Our ensuited Jungle Bures are perfect for a romantic couple getaway. Ideally situated only a few meters from the waters edge the Jungle Bures line the shore sending you off to sleep each night with the gentle rhythm of the water lapping the water’s edge. Our Treehouse Bures are located close by to the beach and nicely shaded by the trees, they are also ideal for couples and friends travelling together wanting a little more comfort and privacy than the Paradise Dorm where budget is a consideration. Perfect for the budget traveller our air-conditioned Paradise Dorm features 32 beds divided into four bed cubicles. Mantaray Island Resort offers a range of accommodation from our budget Paradise Dorm to our newly built luxury Villas, there’s something to suit all travellers. Full payment will be taken when booking on-line. Cancellations will incur a 25% cancellation fee. All cancellations received within 14 days of arrival will incur a 50% cancellation fee of the full stay. All cancellations received within 7 days will incur a 100% cancellation fee of the full stay. All no shows will be charged 100% cancellation fee off the full stay. Cancellations after check in will be charged in full all nights not utilised. Credit cards welcome (Mastercard, Visa, Amex only).